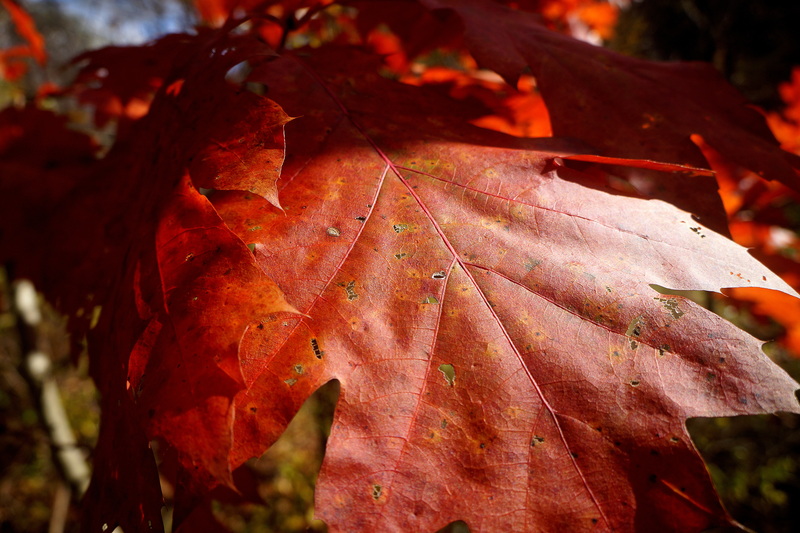 In autumn, a single maple tree can carpet an acre. So then you can cut a rug, and dance in the leaves. 4. 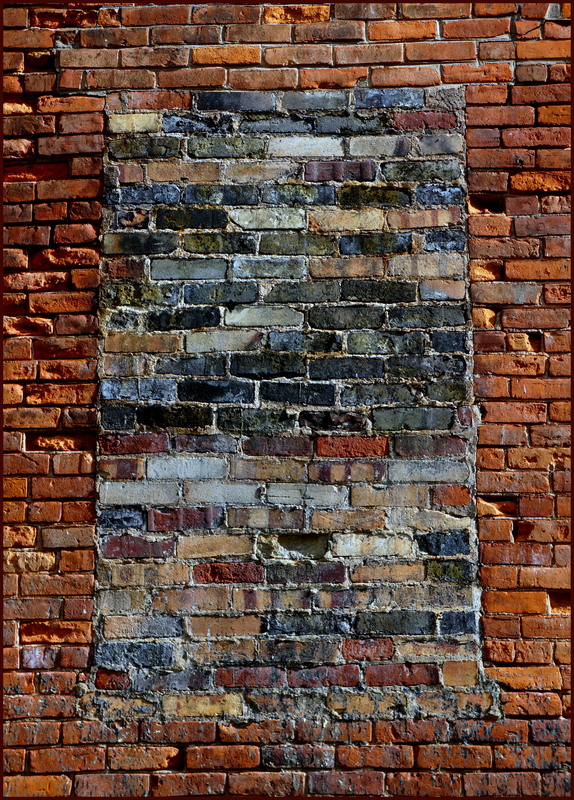 A lot of different hues in the bricked-up window of an old mill. 5. 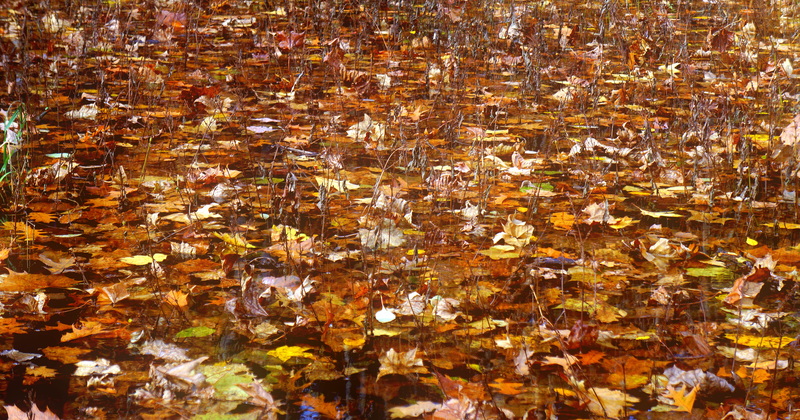 A marshy area was saturated with leaves. 6. 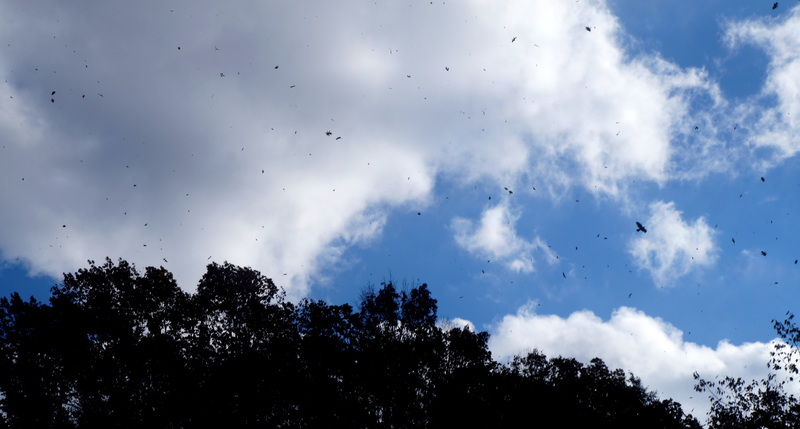 Oak leaves swirl around, hundreds of feet in the air, almost like they’re trying to follow that hawk. 7. The holes in this oak leaf are pretty small, apparently the bugs only took a few bites before buzzing off. The high tannin content in oaks, redwoods, etc. provides some level of protection, from bugs, bacteria, and fungi, but of course, we happily ingest small amounts of tannin every day, in coffee, tea, chocolate, berries, etc. And I prefer to use witch hazel solution, another source of tannin, instead of aftershave. I read recently, that scientists have created some high-tannin tree hybrids, to discourage beavers from chomping them down. 10. The bridge now serves as a trellis for wild grapes. 12. 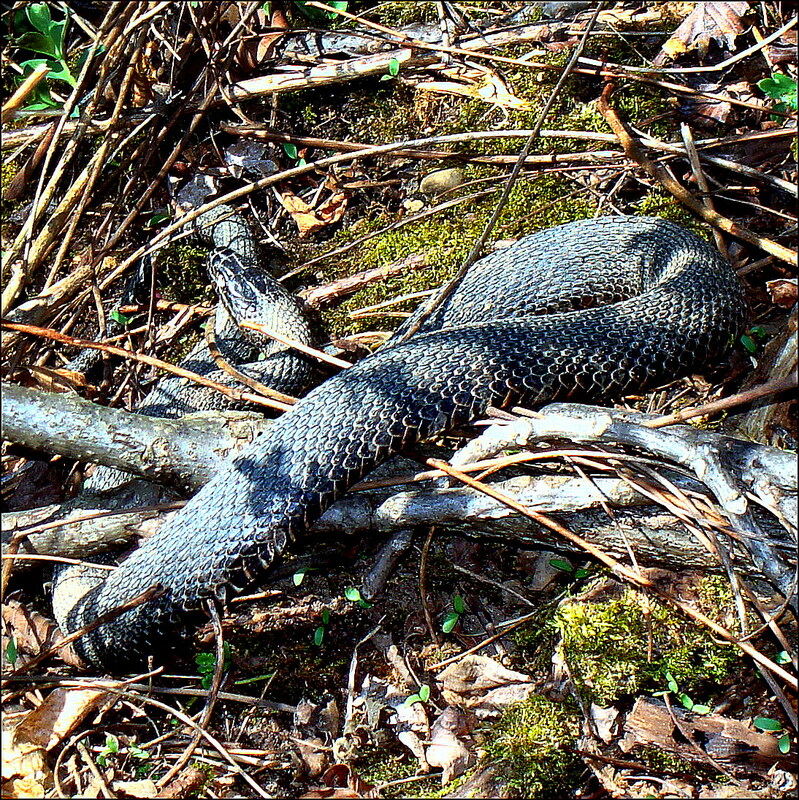 Tentative identification: Black Rat Snake. Kind of a terrible name, I think it’s actually pretty handsome. My only complaint, is that it can climb trees, and that sort of behavior by snakes should be discouraged. Keuka Lake just doesn’t fit in with the other Finger Lakes. It’s absolutely lovely, but it only resembles a finger, if you got careless using a table saw. It’s really shaped more like a crude letter “Y,” if you drew it in the dirt, with a stick, blindfolded, liquored up & left-handed. Go ahead try it, we’ll wait. Anyway, to me it looks more like a forked branch, and in fact, the hamlet on the northwest branch, is called Branchport. 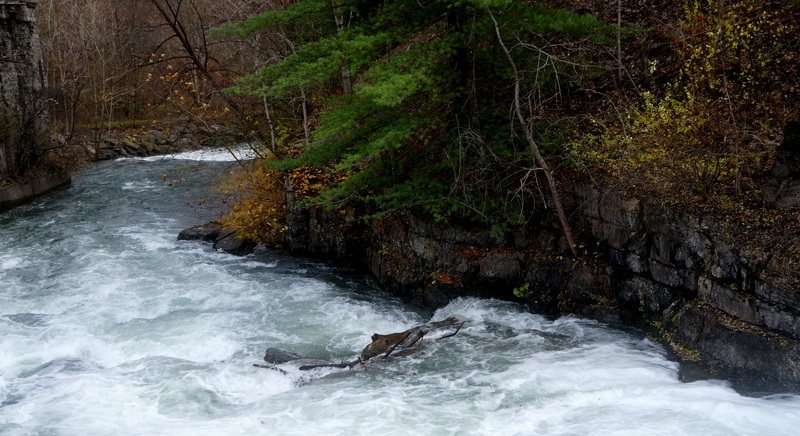 At the top of the other, northeast branch, there is a creek which flows from the lake, through the village of Penn Yan, heads east, and eventually drains into Seneca Lake. The village has a fascinating history, and was once home to a Quaker sect called the “Society of Universal Friends”. Maybe a topic for another article some time. Today I’ll just mention two things – where the odd name originated, and a bit of local history. One – Penn Yan is a contraction of “Pennsylvanians & Yankees,” after the original settlers. Two – The village kind of relocated, without moving – – in a manner of speaking, it was once in Massachusetts, even though that state is 230 miles away. It’s located just west of the 1786 “Preemption Line,” a north-south line bisecting New York, from the Pennsylvania line, to Lake Ontario. You’ll cross a marker for the line, walking on the trail. Meanwhile, while all this was going on…the natives were dispossessed, settlers moved in, Rochester and Buffalo were founded, and eventually, in 1960, the Bills joined the AFL. That’s as brief as I can make it. Is that all clear? Welcome to New York, the State of Confusion! Anyway, at Keuka Lake, there were settlers from Pennsylvania and New England = Penn Yan. In an area replete with interesting place names – drawn from Europe, classical Greek and Roman history, Native American sites, and land speculators – this creek we’re going to walk along, was somehow left with the utilitarian and totally un-poetic name of Keuka Lake Outlet. “Outlet” means a discount factory store, or a place to plug in a lamp, or a method of venting. This is a waterway desperately in need of a good PR firm. Brook, stream, bourne, creek (prounounced “crick” by the older folks here) – – any of these are better. Heck, I’ll take “runnel” over “outlet” any day. In the 1830’s, the state government constructed the Crooked Lake Canal alongside the creek. “Crooked Lake” is another name for Keuka, and is not a reference to state officials. The canal had the distinction of losing money for each & every one of its forty-four years of existence. 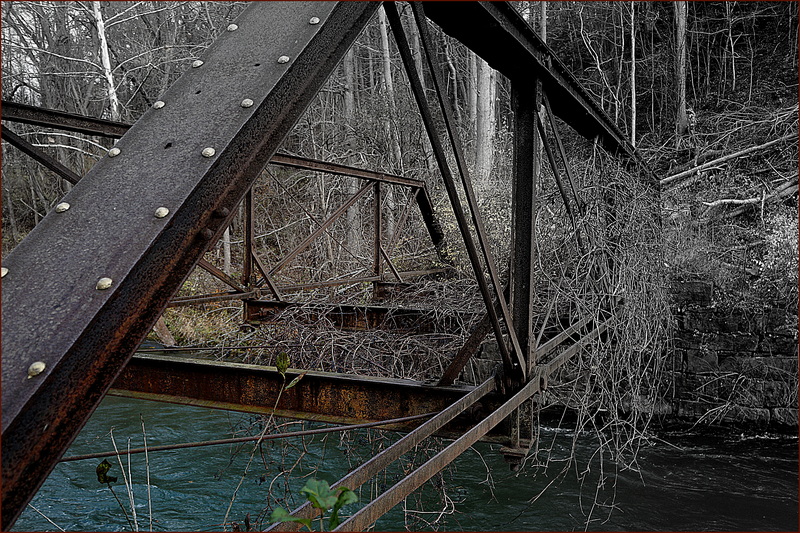 It was replaced by the Fall Brook Railroad in the 1870’s, which was in turn washed away by Hurricane Agnes in 1972. A local group restored six miles of the towpath/railroad bed, and created a walking trail, from Penn Yan, on Keuka Lake, to Dresden, a hamlet on Seneca Lake. The creek drops 270 feet, from Keuka to Seneca, and in the old days, it powered three dozen mills and little factories, starting in 1790. Buckwheat, paint, plaster, paper, tanneries, etc. and in more recent times, insecticide. So, depending on where you were standing, it must have smelled like breakfast cereal, or like paint, or just plain horrible. Until well into the 20th century, a key component in tanning leather was dog manure. Where they got it, how it was transported, and what price it fetched on the open air market, we’ll reluctantly leave for another day. Quickly segueing to hair of the dog, there was also a distillery somewhere along here, which, with our forebears’ customary frugality, included a hog pen. The hogs consumed the leftover mash from making alcohol, and no doubt contributed to the general eye-stinging atmosphere of the place. In summary, the 19th century along the stream was a bucolic tiptoe through the daisies. 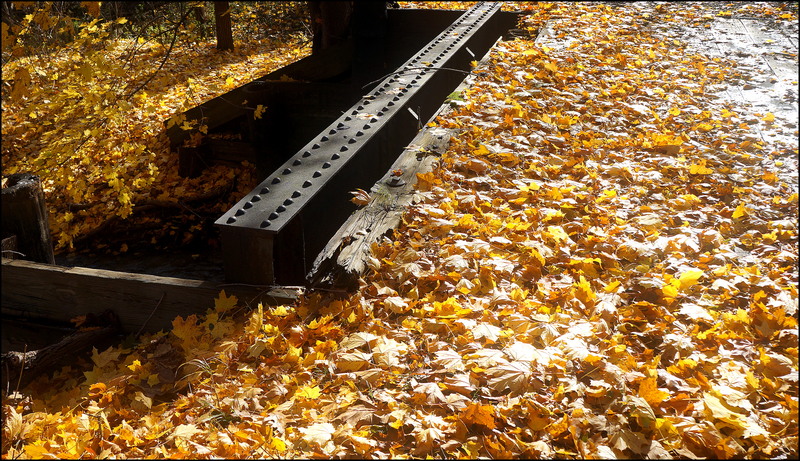 Most remnants of the 19th c. industries have fallen down, crumbled, and been washed away over the years, but as you walk along the water, through what is now a wooded ravine, you’ll pass a few traces. Circular stone and brick pits, nearly filled-in with dirt and leaf mold. A towering brick smokestack, rusted remnants of water turbines, some foundations made of huge stone blocks, and a couple of crumbling concrete buildings from the 20th century. A triangular chunk of millstone, embedded in a tree’s roots. The shattered remains of a steam boiler, and a massive iron fly-wheel, were removed a few years ago, and taken to a local steam engine museum. 16. A wall from an 1884 mill, that converted straw into paper and cardboard. During WWII, it was running full-time, making paper to wrap munitions.. 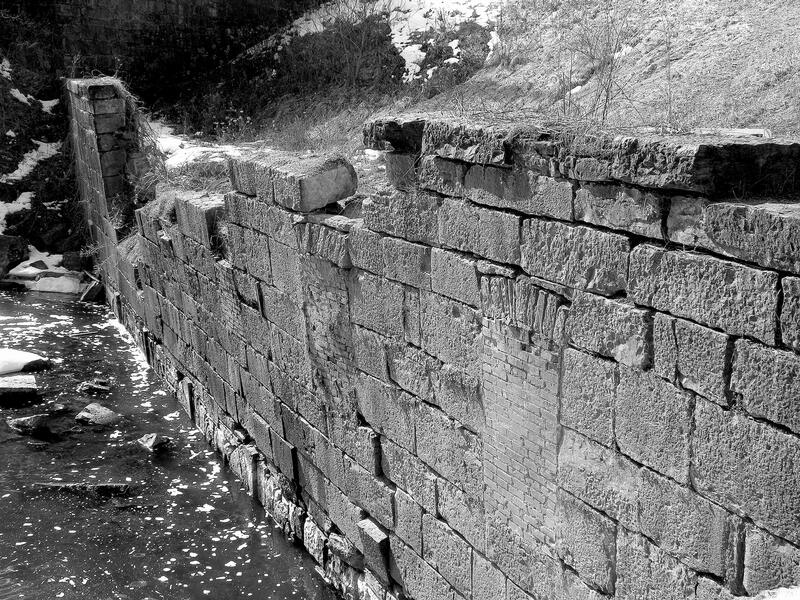 Some of the stones may have been re-purposed from the canal locks. This was taken four years ago, and I believe most of this wall is now in the creek. Generally I’m a big advocate for historical conservation and preservation, but somehow in this little valley, it seems just as positive and proper to watch this creek return to its natural state. Even as the industrial relics vanish, there’s sometimes still an old-fashioned feel to the little valley. Many of the nearby farms are Amish or Old Order Mennonite, and young couples from the farms come to the falls to picnic and court, arriving in horse-drawn buggies. One of the families, the Hoovers, has a welding/blacksmithing shop, and I’m guessing it was one of their sons, who showed up one day with an all-metal buckboard. 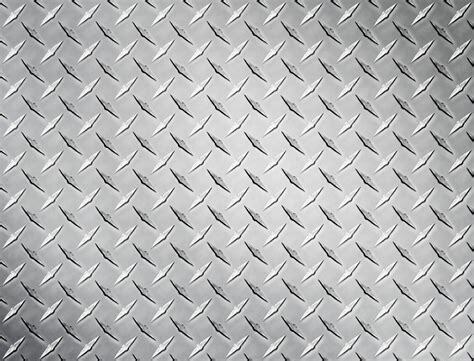 Gleaming steel diamond plate, like they use for factory floors or pickup tool boxes. Must have weighed a ton, but dazzling, quite a sight. I’m guessing the church elders found it to be an act of vanity, and made him get rid of it, or perhaps his horse died, dragging it back up the hill, but I never saw it again. Walks Around the Finger Lakes. Keuka Outlet Trail. → Walks Around The Finger Lakes. Watkins Glen. November, mostly. ← A hike of new expectations. Volcán Villarrica, Pucón, Chile. Your post corrected many misconception I had of the state of New York. There is so much beauty and you discovered for us a veritable natural paradise. The fall colours are superb and surpass anything I have seen around the Arrow Lakes. Thank you very much of bringing these lovely images to our attention, Robert! The incredible beauty and the clean mountain air of the Rockies has always been a great attraction to my wife and me. Just call me Peter, Robert. Mr. K. sounds so formal, almost German. Haha! My father came to this country as a teenager in the 1920s from an area that is now part of Ukraine but was then controlled by Russia (some things don’t change). His family fled the dual scourges of anti-Semitism and Communism. I mention this because my father grew up on kasha and loved it all his life. As fond as I am of other grains, I never did develop a taste for kasha but I made it for my father whenever he visited Austin. Yes, Keuka Lake has an unusual shape. Glaciers do some weird things to the land they pass over. 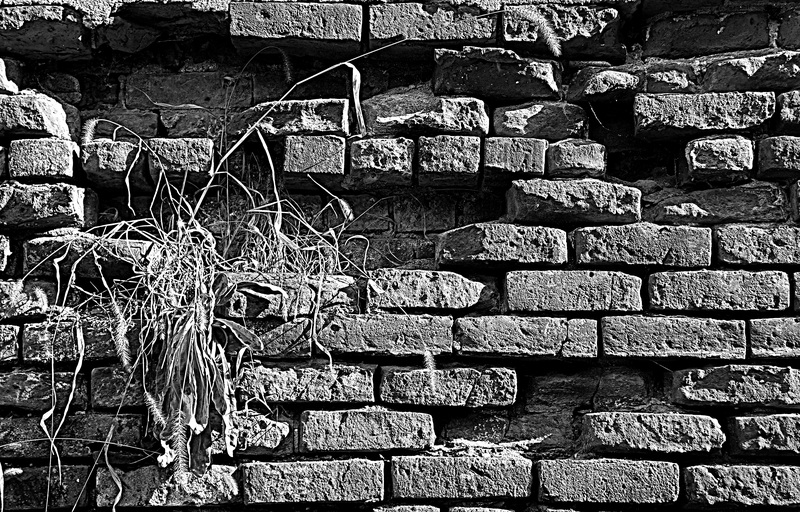 If you could buy the piece of wall that includes that bricked-over window, I’ll bet you could sell it to a museum for a hefty price. You’ve got some great fall foliage here. I especially like the picture of the leaves in the marshy area. Thank you, Steve. I’m sure that’s a fond memory of making a batch of kasha. I’ve gotten pretty fond of eating farro, which I just saw in Wegman’s, and tried one day. I know buckwheat’s a good healthy meal, and I like to mix some in when I make pancakes. That village has a huge metal pan hanging on the wall of a building, 28′, and for years, the village had the record for making the largest buckwheat pancake in the world, but perhaps that might have been passed. A lot of my youth was spent upstate – only the best of memories!! Thank you! I know you don’t like snakes, but blacksnakes are pretty agreeable. This was a fascinating and beautiful tour of the area, Robert. I have always been intrigued by the convoluted history of New York. How cool it must be to walk those paths and encounter bits of the past. And the snake! Marvelous. I grew fond of black rat snakes when we lived in Peoria but I agree with you, there is something decidedly disagreeable about seeing a snake at eye level on a tree! Although I believe they are very useful in one’s attic. Thank you, Pit, glad you like ’em! Another rich post, Robert….many fine photos, too. I love the oak leaves high in the air and the closeup and river photo (#6,7,8). And the old bridge – nice colors! and the old brick arch, what’s left of it. You get the feeling across well, of the finger lake area. The story of the land ownership is so wacky, it just goes to show how ridiculous the whole idea of land ownership is, ultimately. How cool that Birkett Mills is still grinding buckwheat. As usual, you have included just the right number of asides and silly facts to keep everything moving along…..
For a sleepy little corner of the world, there’s tons of history. Dresden, the hamlet on Seneca Lake, at one end of the trail, has a house museum that’s the birthplace of Robert Ingersoll, who isn’t much remembered now, but in the 1800’s, he was an incredibly popular speaker. And what’s amazing and interesting to me, is that people would turn out by the thousands, to hear him talk about humanism, agnosticism, and women’s rights. It doesn’t really synch with most people’s image of the repressed and rigid Victorian times, to have folks flocking to buy tickets to hear a freethinker, and his essays and speeches on outdated religious doctrines were reprinted and discussed everywhere. I’ve wondered if a lot of those oldtime Victorians were actually more open-minded than people in our time. Like nature, you’ve painted with a broad brush here. The history of Amish leaves? Bridge over the river Penn Yan, which ran into Crooked Lake, where the crooks passed off a bunch of failed land schemes? Keuka Lake certainly does have an interesting shape. It looks like a dowsing rod, although a dowsing rod made of water would be — well, odd. 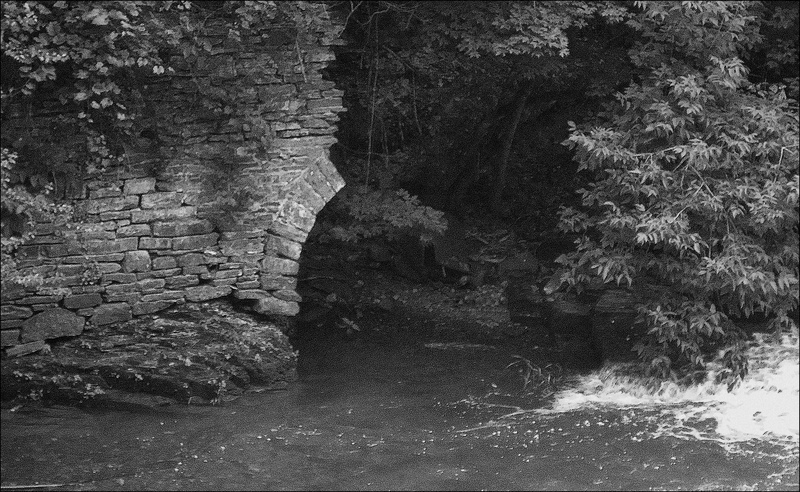 It must have been a happening place along those streams when all of the mills were active. I’ve always heard place names like Grogan’s Mill without realizing there were real mills behind them. That’s what comes from being a flatlander, I suppose. Then there are those groats. When you mentioned them, I realized I didn’t have a clue what a ‘groat’ might be. Imagine my surprise when I learned the steel-cut oats I’ve used for years are sliced oat groats, or that the bulgur wheat in tabbouleh is actually wheat groats. Apparently buckwheat groats are part of the ‘groaty pudding’ that the Brits eat on Guy Fawkes night; the groats are soaked, combined with beef, onion, and leeks, and then baked. It doesn’t sound too bad, if there’s no pizza delivery in the neighborhood. 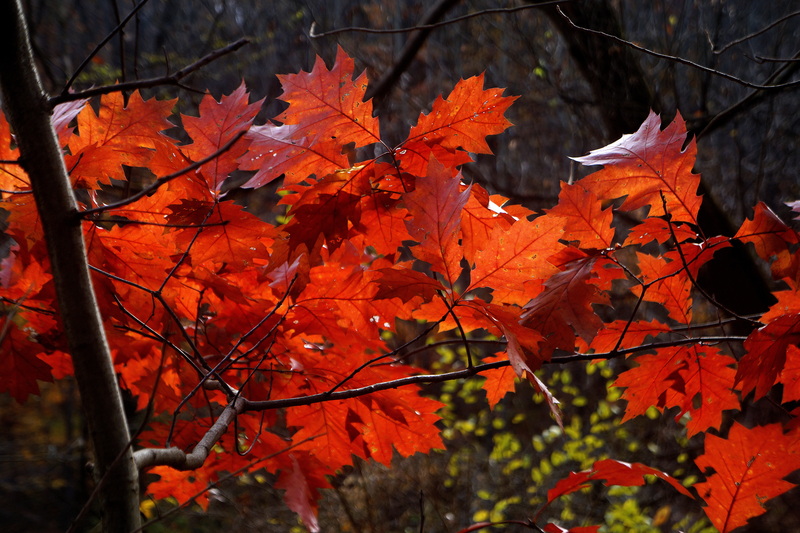 Your various photos of the foliage are gorgeous, but I really like the first one. I can almost smell the dust that gets kicked up from a heavy, dry leaf cover. 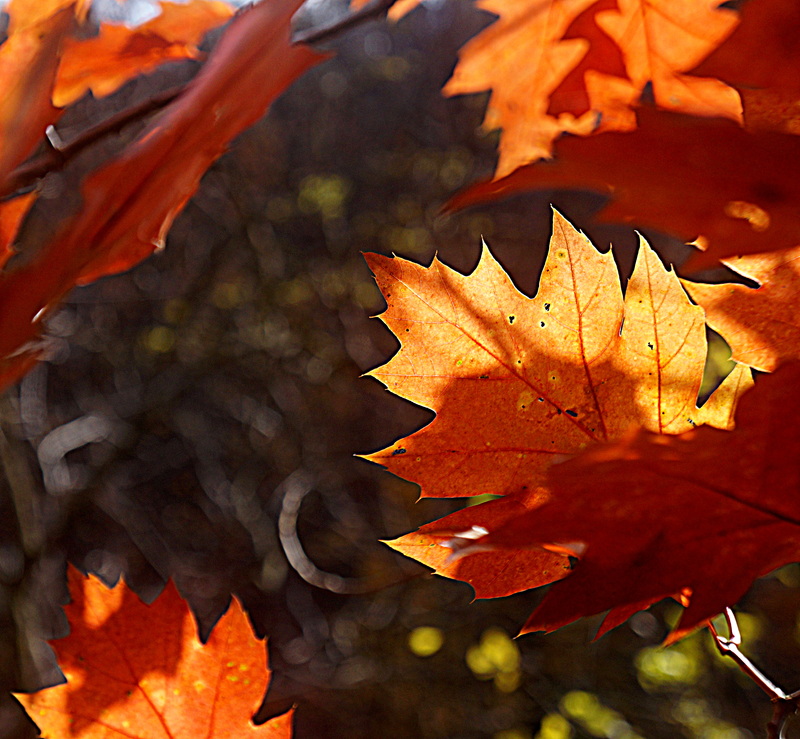 There may be people who can resist shuffling through fall leaves, but I’m not one of them. Awesome photos and writing, well done. Your post and a few of the comments above touched on history and I always think it’s amazing how much history can be found in rural areas and, unfortunately, how much of it is overlooked … even though it really does intersect with the “big history” that people are more familiar with. A few years ago my dad gave me a handful of documents from the abolitionist movement that he found tucked away in the ceiling of his boyhood home — an old stone house around the corner from where I grew up. He had no idea how they ended out there, but among the documents is an 1840 handwritten letter to the abolitionist Lewis Tappan from one of the slaves taken captive from the Amistad … now who would have thought that such a thing would turn up in the rafters of a little stone house in Cadyville, New York? Oh glad you enjoyed them, thank you! Amazing colours and so beautiful. You captured the beauty of the walk wonderfully. Thank you, Otto, I’m so pleased you liked them! A fascinating post and wonderful photos Robert. You do a great job of sharing history injected with a sense of humor. You’ve captured the history and nature’s beauty of this area. Thanks so much, Jane! I really appreciate it. I really like image number ten. That is something, those grapes just…….hanging there, like that. Sheesh. Something about pointing the hangingness of the grapes makes me feel pretty silly. You’ve got a lot of brainy readers but I’m not one of them. Since I’m dropping pretenses, I might as well add that in a Suspension of Disbelief and Reality scenario I like to imagine perhaps some orangutans or howler monkeys could swing out there because they’ve got the sort of articulated-like shoulders but to be honest I’m not sure how the grapes would fit into their diet. As usual, it’s good to stop by for a read. Hope this finds you doing well, Robert. Thanks T-Fir, I wasn’t sure about that picture, so glad that somebody liked it. If you get a hot summer, the wild grapes are actually semi-edible. There’s vines, too, along all the creeks, that will definitely hold a human weight and you can swing on them. Come to think about it, nobody, and no birds, whatever, seems to eat those grapes, and they’re sour but not bad really. There’s a lot of fantastic photographers, artists, writers, even poets, on WP, I’m none of those things, I just enjoy their posts, and sometime tell them what I think, and usually we all get along pretty well. In college, there was an incredibly intellectual prof, who talked about “close reading,” and I figure even if I don’t have any amazing insights or expertise, most people just appreciate someone actually reading their stuff and paying attention, and if my comments aren’t erudite or scintillating, oh well. I’ve definitely been “meeting” a lot of pretty nice folks here.